I've been conscripted into an escelating war. My good friend asked for some assistance in making his daughters powerwheels truck the most capable vehicle possible, to give her an edge in the play time drag races. Since I can't say no to making his kids smile, and am a speed nut, I of course accepted. The need for speed resulted in a 24V conversion using two 12V group 16L AGM batteries in series for 24V. In the name of safety, we also added a low tone car horn at the same time. Who am I kidding, it was to blow the competition out of the way. This lead to a new GPS verified top speed of 10MPH in "high gear" with each motor getting 24V, with a few smoked factory motors as consequence. Other problems that came to light were the severe lack of traction due to the rather ineffective blow molded hard plastic tires, and the dangerous yet fun abrupt on/off throttle and brake response. Power slides and donuts for DAYS. 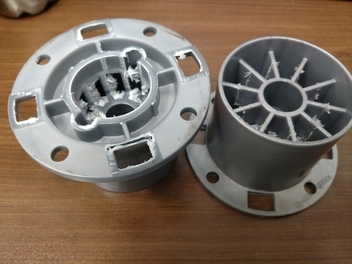 Thus, a 24-48V motor controller with foot pedal was ordered in, along with a set of 13x5 pneumatic tube lawnmower tires. 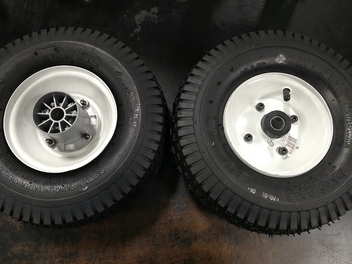 A little work to the factory couplers on the lathe and some holes punched through the rims to attach the couplers made for a new set of rear tires. The back "axel" needed to be shortened by 2.5" to accommodate the new setup. Because the factory motors didn't like the start/stop 24V torture and all of them went out in a melting mayhem of fun crushing proportions, in went a forward/reverse rotation set of Traxxas Titan 21 RC motors rated for 14.4V. We also made some shaft spacers to fit the same tires on the front, but the change in scrub radius was too much for the janky steering setup that these have. Steering became too hard, and tended to snap full left or full right. The old hard plastic ones went back on instead to prevent a rollover. One of the future steps is to install bulbs in the headlight and turn signal housings and wire them up for full function. I ordered in a 24V wheelchair differential transaxle to replace the factory gearbox/motor combos and give some true capability to this thing. Also in the wings is a golfcart steering rack to provide some much needed maneuverability. Since it's a unibody, this will require a frame and some customization to the body to pull off. More photos to come when I get a chance to take them. hahaha. This is awesome. I want to see pics of the whole thing! Nice work! Steering rack is on the way! This is sweet. Can't wait to see it go. I was able to wire up 3 car batteries in series on an old Bigfoot power wheels before we fried the factory motors hahaha. I'm looking into the possibility of getting a few NiMH cell packs from a Prius battery. Might be a cheap way to get 48V and reasonable range, without the problems of lead acid batteries. Snagged 10 used Gen1 Prius cell modules off ebay. Should be here next week Wednesday. They're 7.2V per module, 6 cells in series. I also grabbed a coulomb counter/under/over voltage all-in-one gauge from Amazon. It has provision for an external load disconnect relay, so I can keep the pack from dying a slow painful death. The wheelchair transaxle is quite beefy, all metal gears, and looks to be easy to modify with longer shafts to get the track width out a bit more. Things are getting serious it seems. Maybe start off with a full tube chassis? Yeah, it's going to need a frame to hold the rear axel and the steering stuff. I still need to get some measurements off the body, and get the track width thing sorted out. Got measurement of outer fender width at 35.5"
We'll be using MTD 20x8 rims since we have a few sets already. The transaxel shafts are 20mm, turned down to 3/4" on the wheel ends. We need to cut flats on the ends to fit the wheels on, and then we can bolt things together. Should fit pretty good, and it'll clear the fenders nicely. 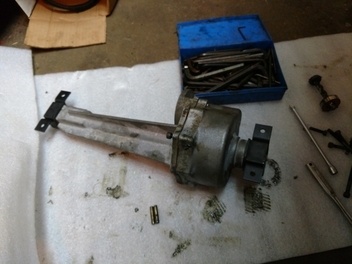 Shot of the transaxel after shaft removal. 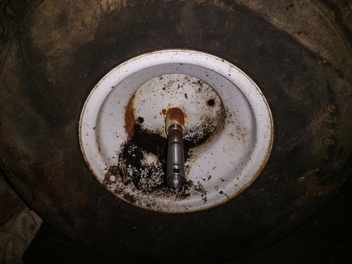 Wheel with the shorter shaft stuffed in. Got the flats milled on the shafts Wednesday after work, forgot to take photos. The shafts fit the wheels, but the bolts and washers I got to retain them went AWOL. Looks like the next step is to make the rear half of the frame and decide on how the steering should be implemented. I did get a 1.2m chunk of 21mm shaft material in case I decide to make some new shafts to adjust the track width. The Prius cells I have are not cooperating at all. Part of it is they are reduced capacity salvage cells (I knew what I was buying, took a gamble), and part is that I have been unable to clamp them tight enough to prevent them from bulging and destroying themselves. I was also a bit impatient, and tried to skip the slow trickle charge and discharge stuff. The test subjects did NOT like that. So far two of the ten are guppies. I'll make a steel clamping jig and try the arduously slow 3 day per module rebalance procedure, and see how it goes. My guess is I'll have to cut my losses and we'll stick with the AGM lead acid cells. One of the parties involved in the playtime drag races now has a gas powered cart, and rules were bent so so he can ride on the road (looooong story...), so the space race is on and the cold war is heating up. I like the sounds of all of this. Doesn't something exist that can save these batteries? I feel like I have heard of some device that basically makes batteries work again. I already have an RC charger available that will work with the 6 cell modules, I just need to not use the 1A charge setting. The RC motors burned out a few weeks back, after a grueling few hours of continuous racing. We went to mount the transaxle in, did some modifications, and came to the conclusion that plywood and 2x4 would not work. The thing has enough torque with the existing controller that it was able to split the wooden mounting brackets. Another issue is the existing controller does not have any provision for braking or regen braking, which is a safety concern. I've got a VESC controller coming in from diyelectricskateboard which allows for true accelerator and brake inputs, regen braking, and will handle 50A with a small fan and heatsink. Also ordered an 8 cell lithium pack rated 30V 27.2AH nominal. Quite compact at 11"x7"x3" and only 14.25 pound. The frame build will happen as soon as we get the unibody from my friends place. Front is getting golfcart steering rack and gocart spindles, no suspension.